-Greater heat resistance than a conventional double jacket fire hose. Hose will not burst catastrophically even with a ½” diameter hole through both the jacket and liner. Low drag coefficient making it easy to pull during attack operations. Underwriters Laboratories listing and Factory Mutual approval available on 1½” and 2½” diameters. n Red Chief/Yellow Chief meet or exceed NFPA 1961 standard. Exceptional heat resistance as exhibited in the BS 6391 Hot Cube Test. 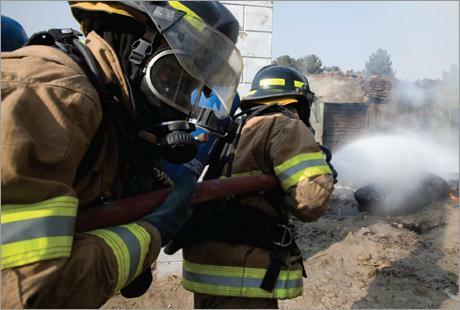 Angus Chief is a lightweight nitrile rubber through-the-weave construction fire hose. Its synthetic jacket is completely protected and locked in by a rubber cover and lining for extra toughness and extra durability. A heavy rib construction makes the hose highly resistant to cuts, punctures, impact and abrasion. Chief is a 600 psi (4200 kPa) fire hose that withstands form 1200 degrees Fahrenheit to -37 degrees Fahrenheit (649 degrees Celsius to -38 degrees Celsius). Its lightweight design is virtually non-kinking. U.L. Labeling and FM Approval are available on 1-1/2” and 2-1/2”. U.L. is limited to 200 PSI.